After the wonderful Navarathi cooking and a break of couple of days, I am back with another Cooking from Cookbook Challenge. 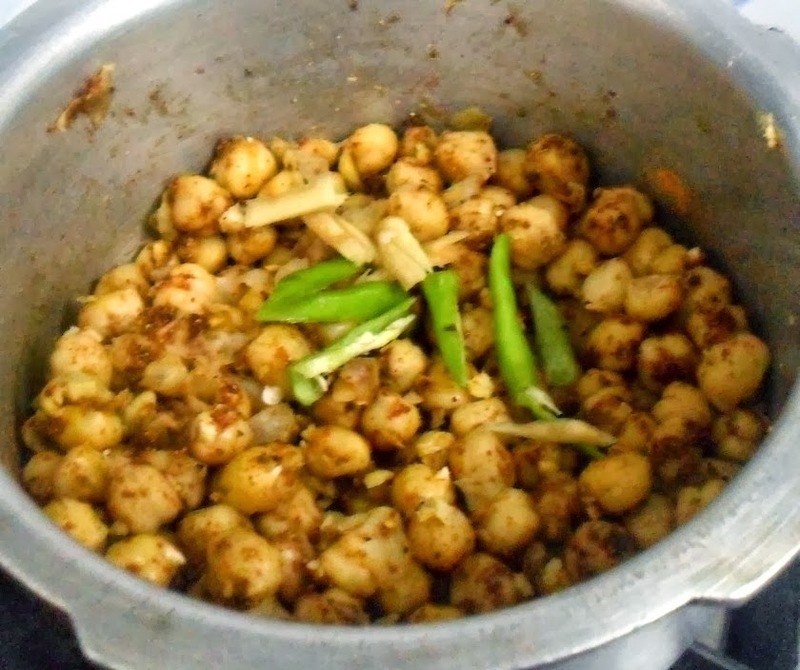 When I was browsing through the books, I came across this delicious Pindi Chana from a Futura Cookbook. I have been wanting to make it for a while. So I thought I might as well do now. This recipe is to be Rawalpindi Style, I am not sure how true it is, however the recipe name goes after the place and is supposed to have been originated there. Anyway this is a dry dish and makes a great combo with rotis. This was my dinner, while I made a non veg meal for the family. So I had just my parents to enjoy this treat. I saved up the dry version for myself, just as it was supposed to be served, while I had a little gravy for parents. This goes for my Side dish mela as well. And yes this is part of the Cooking from Cookbook Challenge, joined by my friends. Dry roast in a non stick pan, cool and powder. Keep it aside. Wash and soak the Chickpea overnight. Change water couple of times. 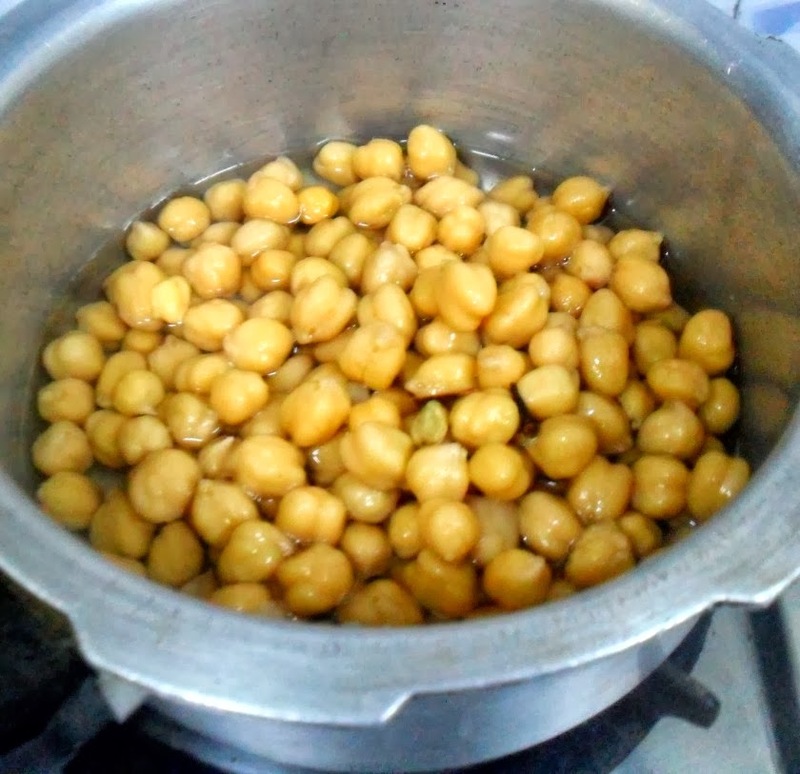 Take the ingredients listed under to be pressure cooked, add enough water and pressure cook for 3 – 4 whistles or till the channa is cooked well. Allow the pressure to fall down. Open the lid, drain the water and reserve. Add salt, pomegranate – cumin powder, roasted coriander powder, mango powder, garam masala, pepper. 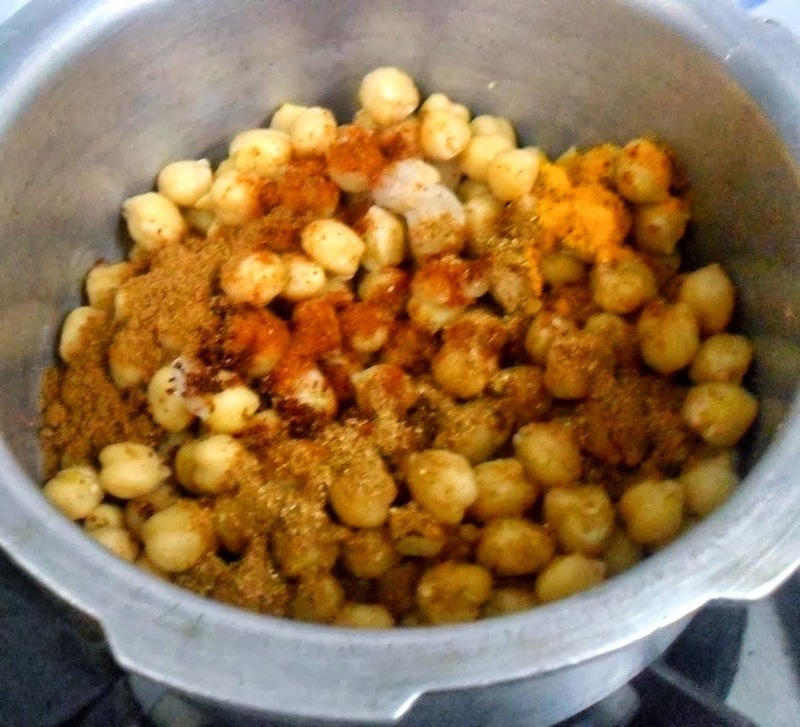 Mix till the chickpea is well coated with spices. Sprinkle finely chopped chilies, and ginger on top. In another pan, heat ghee till smoky and pour over the chickpea. Now add reserved water. Cook the chana further for a while till all the liquid dries up and oil separates, stirring making sure the bottom doesn’t burn. Serve hot, garnished with onions and lemon wedges. Notes:This is an almost dry dish served as such. If you want you can let little water remain if you are not comfortable with very dry side dish. Wash and soak the Chickpea overnight. Change water couple of times. 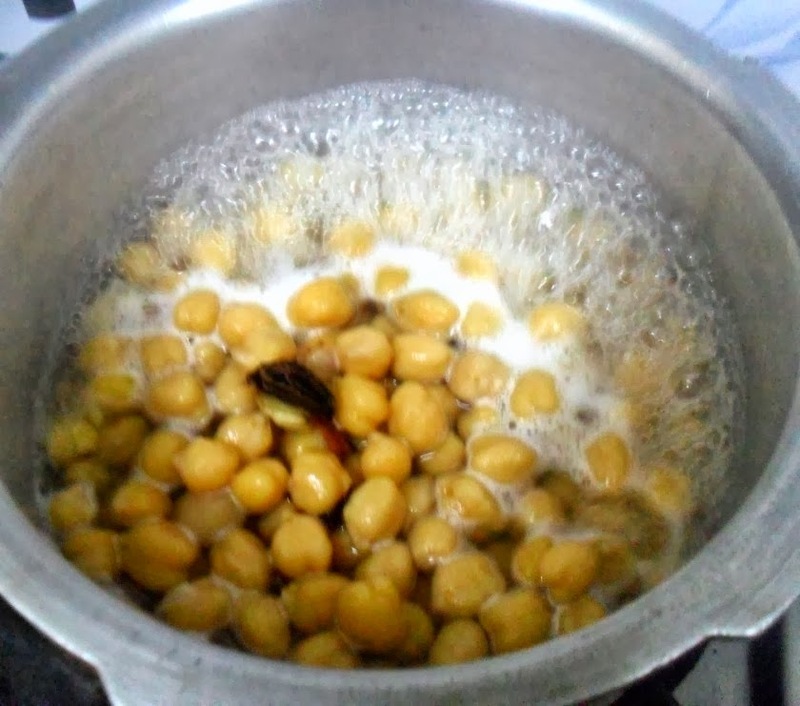 Take the ingredients listed under to be pressure cooked, add enough water and pressure cook for 3 - 4 whistles or till the channa is cooked well. Allow the pressure to fall down. Open the lid, drain the water and reserve. Add salt, pomegranate - cumin powder, roasted coriander powder, mango powder, garam masala, pepper. Mix till the chickpea is well coated with spices. Sprinkle finely chopped chilies, and ginger on top. Cook the chana further for a while till all the liquid dries up and oil separates, stirring making sure the bottom doesn't burn. Notes: This is an almost dry dish served as such. If you want you can let little water remain if you are not comfortable with very dry side dish. Looks yummy! New chole recipes are always welcome! 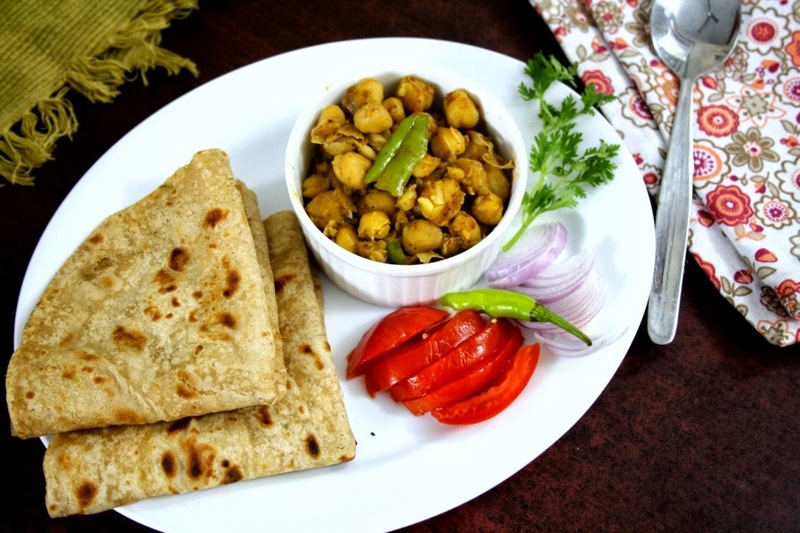 I love channa in any from it has a unique taste just perfect for chapathi/poori/naan so loving it. I too have that futura cookbook valli!!! !channa looks very inviting!!! 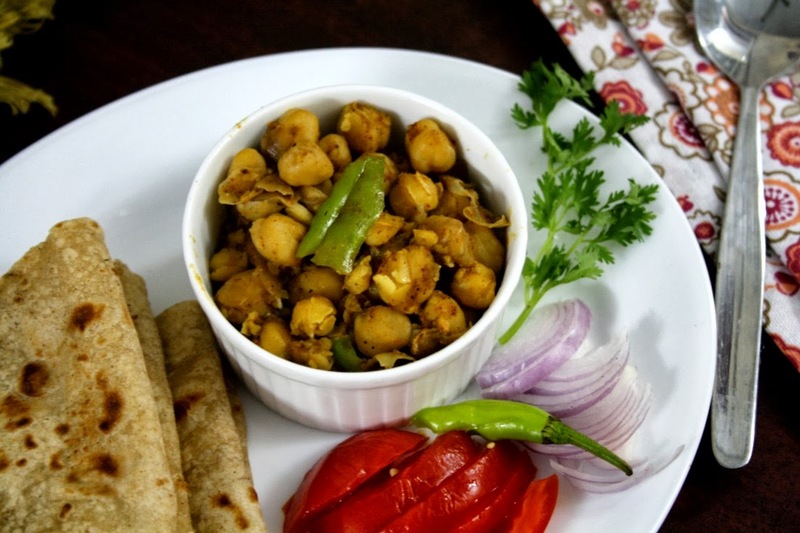 Yummy variation to regular channa masala. Looks yummy!! 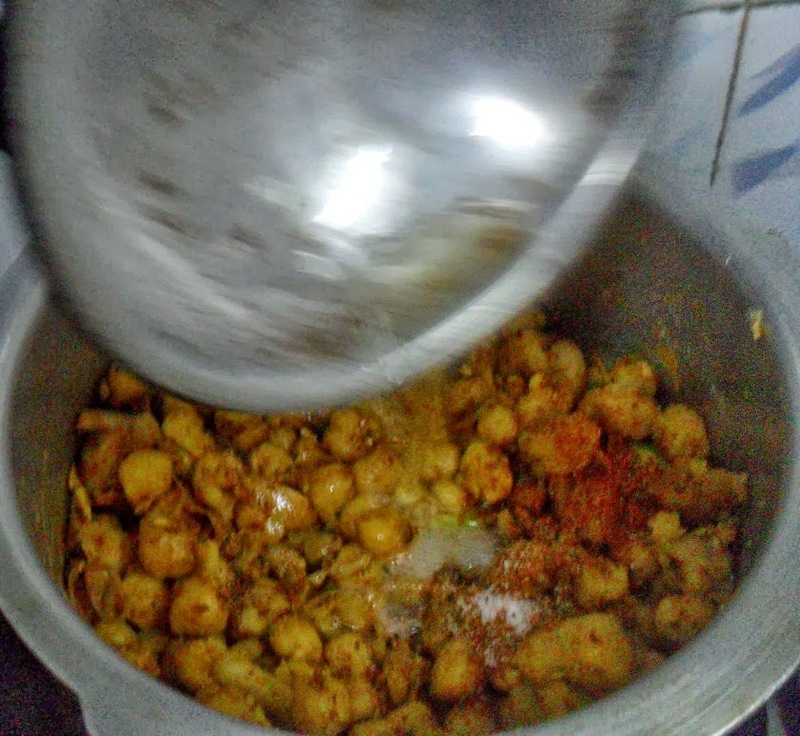 Chana pindi is all time fav…that bowl of chana looks so tasty and spicy! 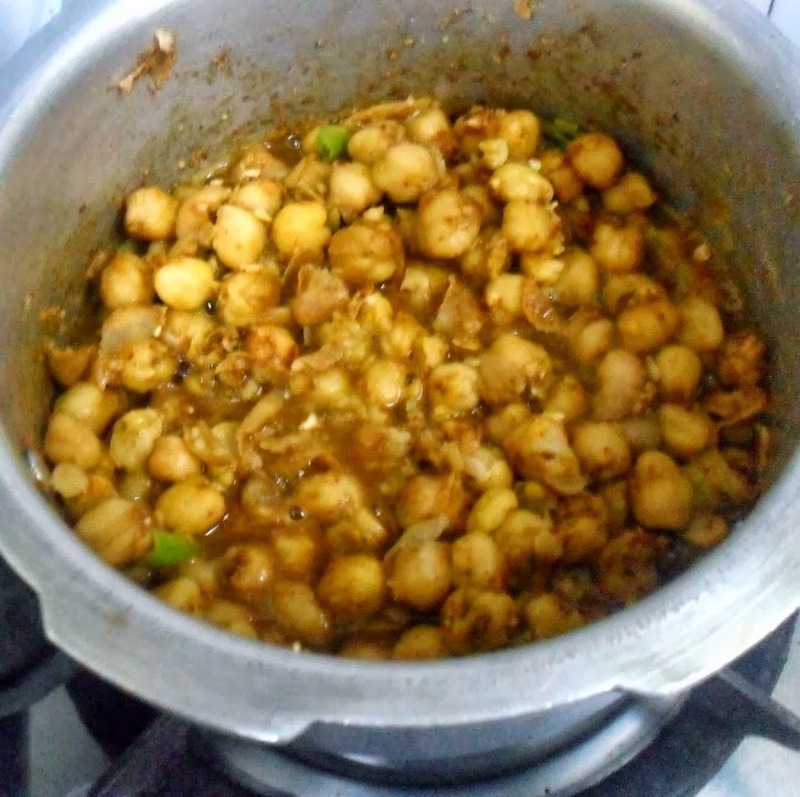 Looks awesome..Chana made in whatever method is always a crowd pleaser! Even I don't need any roti or rice to eat this. I top it with some yogurt, onion, tomatoes and dig in.. 🙂 Curry looks delicious!